Now we’re heading into the final stretch! 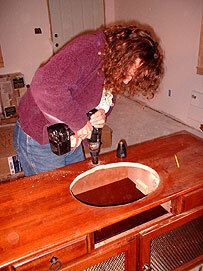 This photo shows Elizabeth drilling holes in the top of a solid oak dresser for the installation of faucets. She is converting the dresser for use as the vanity in the upstairs bathroom. Elizabeth has already cut the hole to fit the beautiful Mexican Talavera sink. Check out the front section where a drawer was removed. It was lucky that the drawer was screwed together and so it was easy to remove the front so it can be screwed and glued in place as a “dummy” drawer. Here’s Elizabeth’s pride and joy – all ready to go. 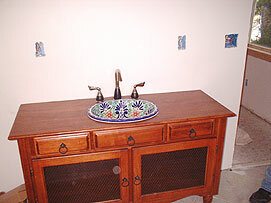 This Talavera sink came direct from Mexico and the dresser from a local flea-market. The special faucet was 75% off at the Home Depot anniversary sale. Elizabeth sealed the top with seven layers of sprayed semi-gloss, polyurethane varnish, sanded between coats. The result is a beautiful piece of bathroom furniture for a fraction of the cost you might expect. Now we’re ready for the electricians and plumbers to come back and install. Yay! Meanwhile, Barbie is nailing in the finish trim around the windows in the living room prior to filling the nail holes and painting them with primer. Next to her is electrician “Rebar” who is about to fit the globe on the ceiling fan he has just installed. Note the circle below the fan that is the fluorescent light tube. 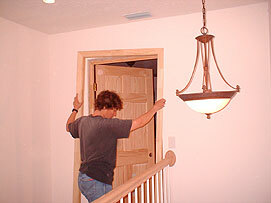 We used these types of light sources wherever we could for long life and efficiency. In the back bathroom, the plumbers are finishing off their install. Here’s Darby and a new assistant connecting up our Envirotech tankless, on-demand water heater. This was another expensive upgrade but it saved us a lot of space, is designed to last 30+ years and saves money, in the long run. It was a good decision. Note the white Nantucket-style vanity and sink in place. We assembled this from a simple kit. Once the electrical outlets, switches and lights were installed and checked out, we had it all inspected by the county. Then the power company turned the power on. 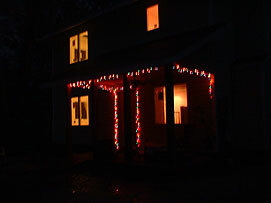 The same day, Elizabeth strung these Christmas lights around the front door and porch to make the newly powered Harmony House as welcoming as possible. 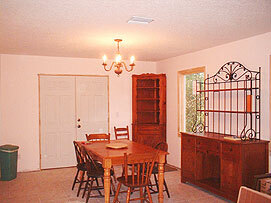 This was the moment that the house really seemed to come alive as a home. 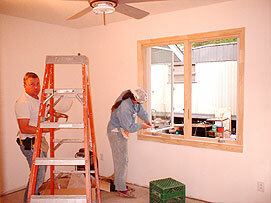 The very next day, our carpenter friend Lilly came to help Elizabeth install interior doors and baseboard. Here she has aligned the solid-wood door in place, nailed it to the opening and now she is fixing the “outside” trim to the door frame. While all that was going on, the kitchen appliances were delivered. We installed the refrigerator ourselves. Here’s Barbie discovering that – yes – there is a little light in there! 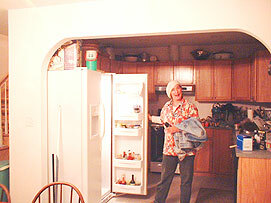 You can see in this photo that we began to move the kitchen stuff in at around this time. Note the gas range behind her – in place put not yet connected. The next day the gas company came to connect up the stove. 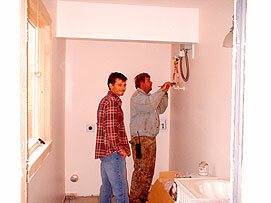 They also came during the pre-drywall utilities frenzy and installed the gas pipe. 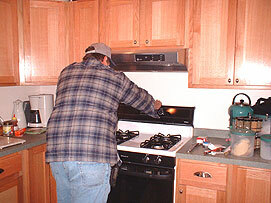 Here, this gentleman is returning the stove to it’s place against the wall after completing his work. Note the nice stainless steel range hood that our electricians installed for us. Doesn’t it look nice? Note that the French doors have not been trimmed out yet. There’s always something! 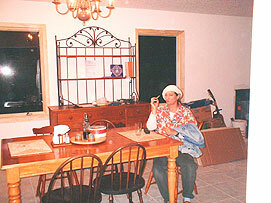 We soon had the rest of our furniture and belongings piled all over the house. Here’s Barbie, exhausted and taking a moment’s well-earned rest in the middle of mayhem to think about the home we are creating for ourselves. There is no doubt that building a house is a totally overwhelming experience, at times, but it is a very sweet feeling when you think about what you have achieving! BTW – that white smudge of paper on the baker’s rack is our conditional CO.
Next – on to completion and bye bye to the trusty mobile home.